Boundaries do not always seem as clear-cut in the theatre as they do in the corporate world. Could you imagine your stage manager leading the entire cast through sexual harassment awareness training? “Alright singers, before we get into the party scene let’s gather ’round to talk about sexual harassment. Sexual harassment is defined as unwelcome sexual advances, requests for sexual favors, and other verbal or physical conduct of a sexual nature…” Yeah, that hasn’t happened at any of my rehearsals either. Just because we don’t have any sit down awareness sessions doesn’t mean that harassment is absent in the world of classical music. Furthermore, when we don’t talk about it, we make it more difficult for musicians to identify the forms of harassment and the various ways to report or address a problem. 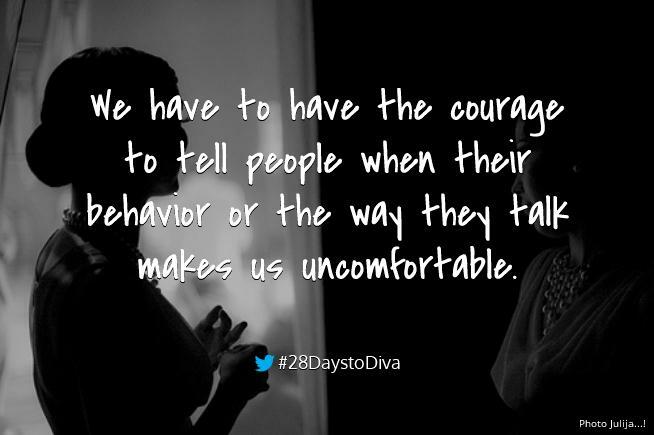 Your Day 24 challenge is to Know How to Respond to Sexual Harassment in Your Workplace. I answered an ad to work backstage. At that point, most of my experience was in downtown, nonprofit theater. The midtown, commercial atmosphere was different, but fun. A young woman about my age takes me through the motions, showing me what I need to do during the show. One night, I’m sitting backstage. My trainer is in a prominent position, waiting for a cue to manipulate the curtain. I turn around casually in her direction and see an actor aggressively groping her. She looks absolutely terrified. It’s her face that woke me up from a sound sleep last week. “That happened,” I thought to myself. Back then, I had no idea what to do. I remember another actor shrugging it off, saying it was par for the course. I was stunned. It wasn’t long before someone connected with the show cornered me in a dressing room, twisted my arm until it hurt and told me to kiss him. The Production Stage Manager discovered what happened to my young colleague. Before the show one night, she questioned me about what I saw. I answered, truthfully. She asked me if I had anything to add. This example helps illustrate one of two established types of sexual harassment: hostile work environment. The actor who shrugs it off and the stage manager who dismisses the situation as a misunderstanding all isolate the one who has been traumatized. How eager is the traumatized actor to get back in the theatre after that experience? I know singers who have quit jobs/gigs rather than bring it up fearing the response. The other type is quid pro quo. We have all heard the horror stories of the infamous casting room couch. The “I’ll cast you in the lead role, if you do this…” story is a form of quid pro quo harassment. You Are the Recipient of Sexual Harassment? Do not assume that this part of working in classical music, opera, or the theatre. Express to the other individual that their conduct is unwelcome. Realize that it should not hurt you professionally to ask them to stop. If the harassment continues, keep a record. Write down dates, times, places, and witnesses to what happened. If you receive any notes, emails, or written letters from the harasser, keep them. Hopefully, you are a member of AGMA and can turn to your representative if you need help to approach the company. If not, you need to go directly to a trusted ally in the executive ranks of the company and explain to them what is happening. You Are a Witness to Sexual Harassment? Be extremely sensitive to the recipient’s concerns. Before you confront the harasser or talk to anyone else in the organization, approach the recipient and ask if you can help. Let the recipient know that you are on their side. Keep records. Write down dates, times, places, and names of others that witnessed the harassment. Approach your representative or an ally in the organization. You Run a Musical Organization, Ensemble, or Opera Company? Remember: you won’t stop sexual harassment by pretending it doesn’t exist. If you are leading an organization, you can establish a policy prohibiting sexual harassment and provide a clear way for people report misconduct. Guarantee confidentiality so that your musicians know that they can trust you. Take every sexual harassment complaint seriously and figure out how to investigate it promptly and properly. Make sure your policy is included with contracts and enforce it. Opera certainly has more than its fair share of sexist plot lines and sexual harassment played out on stage. That doesn’t mean that we, as performers, have to expect anything less than professionalism from our colleagues. There is absolutely no reason that sexual harassment should continue in the theatre. We can all be responsible for making the theatre the safe place we want it to be where we can truly express our vulnerability. Divas, I know that this isn’t the dream big topic that I often write about in 28 Days to Diva. However, there is absolutely nothing that should stop you from feeling safe and respected in this profession. You are valuable. Your voice is necessary. I don’t want anyone to take away your sparkle.